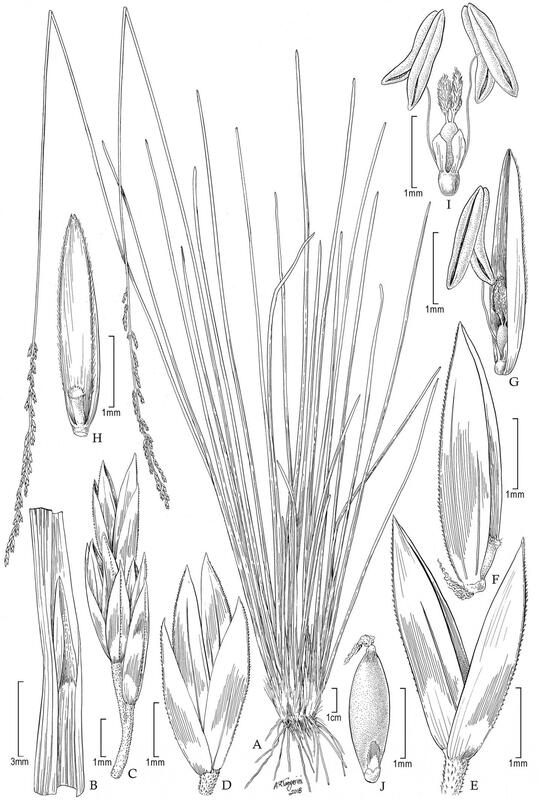 Originally collected 28 years ago in Ecuador, new species Poa laegaardiana has been just described, only to find out its prospects for surviving in its type location seem bleak nowadays. The study was published in the open access journal PhytoKeys. When roaming in the Cordillera de los Andes of Ecuador, near the village of Facundo Vela, little did Smithsonian scientist and author, Dr. Paul M. Peterson, know that a small grass specimen will not only turn out to be an intriguing new species, but will also make a big statement on the importance of conservation. Almost three decades after its original collection the new species P. laegaardiana has finally emerged from its herbarium collection, but the story took an unexpected twist. It took the authors a single Google Earth search to find out that what used to be the natural habitat of the newly found densely tufted bunchgrass, is now occupied predominantly by small farms. Heavy agricultural use of the terrain, poses a good possibility for P. laegaardiana to have already been extirpated from this location. With the species currently known only from this area, chances are that this newly described species, might in fact turn out to be already extinct. "Further studies are needed to search the area and browse collections for specimens from different locations," explains Dr. Peterson. "But, in fact, it may well be that with our study we are documenting a possible extinction of a species, happening in the space of just 30 years. The story of P. laegaardiana serves to show how human-induced habitat loss can indeed be a major threat to the survival of life on Earth." The new species was named after renowned Danish botanist Simon Laegaard, who has made extensive collections in South America, Greenland, Ecuador, and Bolivia (accompanied by the authors) contributing to the documentation of the flora to make informed conservation and management plans.